IWALU | What Does IWALU Mean? IWALU means "I Will Always Love You". IWALU is an expression of eternal love. It can be used during an ongoing relationship, but it is often used as a relationship ends. For many people, the term brings to mind the song "I will always love you" by Whitney Houston in the 1992 film The Bodyguard. 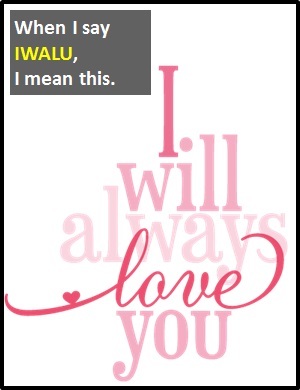 "I will always love you" (IWALU) is an expression of eternal love. Person A: I know it's over but IWALU. Person B: I'm sorry it had to end this way. Person A: We're so lucky to have each other. IWALU. Person B: I love you too. IWALU is a declarative sentence (i.e., a statement). In other words, it is not used as a part of speech in a wider sentence. IWALYU is an initialism abbreviation. Technically, this means it is pronounced using its individual letters (i.e., Aye Dublyu Ay Ell Yoo), but as this is harder to say than "I will always love you," it is not usually said using its letters. In other words, the abbreviation IWALU is for efficiency in writing and not efficiency in speech.